The Choir concluded 2016 with the customary entertainment of guests at the Lake Hotel in Llangammarch.The concert was compered by Jeff Thomas and sang a variety of pieces ranging from “I walk the line” to “Bring Him Home”. Over 25 guests were very appreciative and a request by an ex military man in the audience to sing “Men of Harlech” was referred to “later in the bar”. 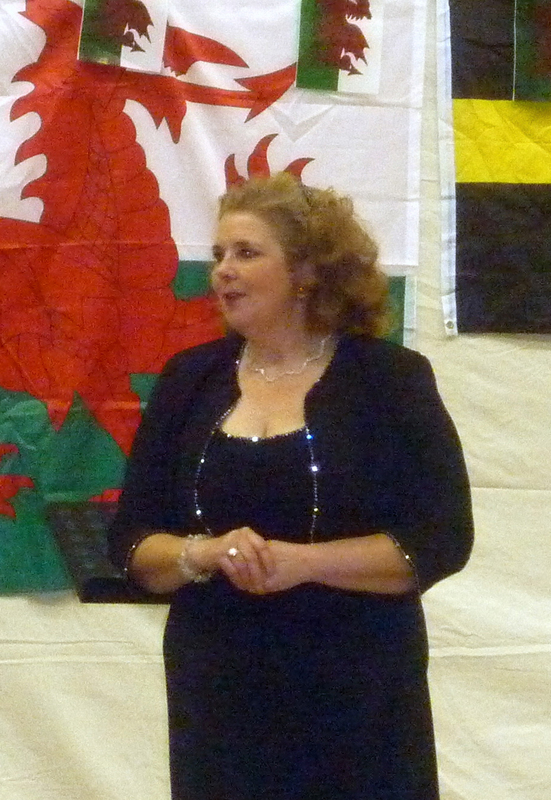 The programme was conducted by Luned Jones, with Ann Bufton, accompanist. Over 70 choristers and friends attended the annual Christmas social at the Greyhound Hotel on Saturday 10th December, where a splendid dinner was provided by Ali and her staff. A key moment in the evening was the drawing of the raffle – with chairman Viv Jones announcing that a splendid total had been raised to contribute to the Choir’s 50thanniversary celebrations fund. President Jim Evans then presented Jeff Thomas with a tie to mark 30 years of choir service. The entertainment for the event was provided by 92-year-old Dai Davies, with many humorous anecdotes about his life, both from his work for an agricultural company, and from his time in the Choir. His memories ranged from time spent in Cardiff, Brecon, Rhyader, and Knighton – to some members of the Choir “busking” in Oxford Street following an Albert Hall concert. On the following day a good number of singers made their way to the Brynhyfryd, where they entertained over 45 elderly people with songs including the “Johnny Cash” medley, and a number of carols. The audience of residents and carers gave a great response, and an additional request for a smaller group of choristers to further entertain one lady who was unable to leave her bed. The Choir received a warm welcome when they travelled to Shropshire on the very cold evening of Saturday 3rd December. The destination was the village of Bucknell and the concert was held in the Memorial Hall. This was built by public subscription in proud and loving memory of 13 local parishioners who had laid down their lives during the Great War. As such the building is now nearly 100 years old, and by happy coincidence the Choir is shortly to celebrate its half-century. The programme was introduced by Roger Bates and compered by Gwynfor Evans. In included a wide selection of music ranging from “I’ll Send A Guardian Angel” (theme song of the Welsh Air Ambulance) to a Johnny Cash medley, and “Bring Him Home” to “Hallelujah”, conducted by both Luned Jones and Adrian Morgan. 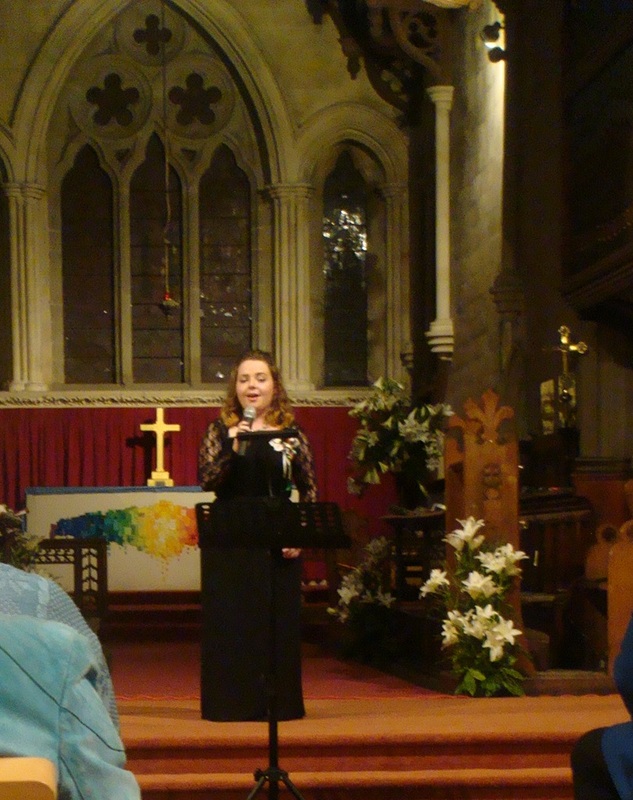 Soloist was the local vicar, Annie Ballard, who sang four different and very unusual pieces of Christmas music. She was accompanied by Ann Bufton, who mastered the repertoire at extremely short notice! The concert started and finished with some carol singing, with an interval serving of non-alcoholic punch and mince-pies. In conclusion a vote of thanks to the Choir was made by Nicola Edwards, a member of the Memorial Hall Fund committee, before we enjoyed a splendid spread laid on for us by local ladies. The Choir launched the festivities at the Builth Fest Christmas Market on Sunday afternoon starting their performance with “Rachie” and the Everly Brothers classic “Let it be me”. The Choir then sang a selection of favourite carols and were joined by members of the audience who warmly applauded the performance. A small but very appreciative audience gathered in the Alpha Chapel in Builth Wells on Saturday 29th October for a Charity Concert organised by Councillor Keith Tampin. Chairman of Powys County Council. 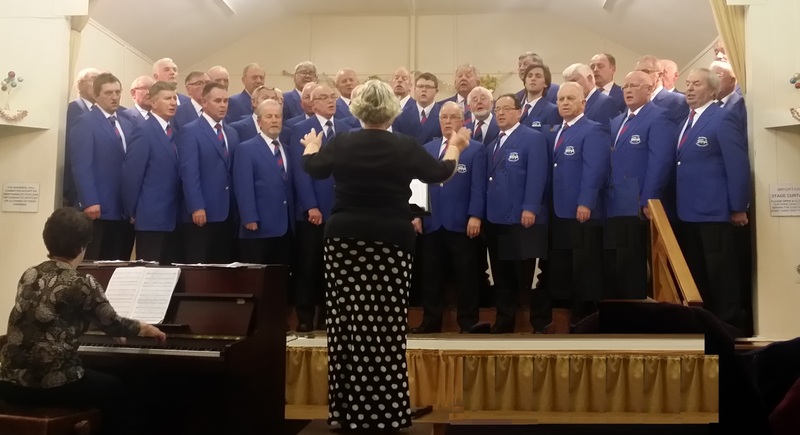 The Concert was supporting Diabetes UK in Powys, and the audience enjoyed a varied and interesting programme by Builth Male Voice Choir, Ffrindiau Ladies Choir and baritone soloist Andrew Jenkins. Among the guests were the High Sherriff of Powys, Anne Tudor; Chris Davies MP; the Mayor of Neath Port Talbot, the chairman of Monmouthshire County Council and the Mayor of Builth Wells Town Council, Meryl Prynne. 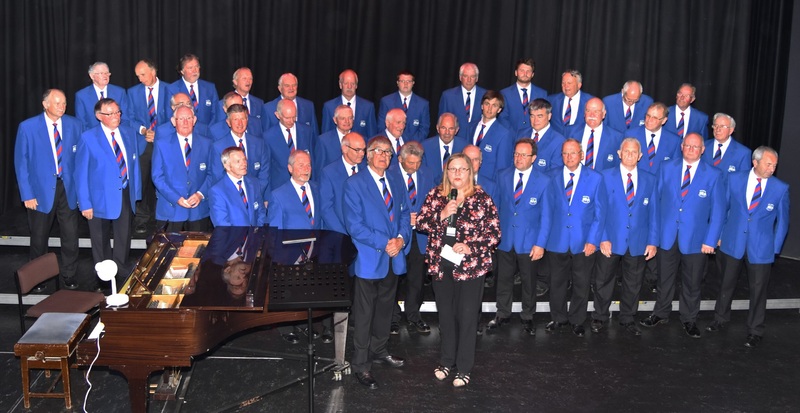 The Ffrindiau Ladies Choir was established in 1974 led by its musical director Kaye Rees and like Builth Male Voice Choir has a long history of supporting charity concerts. Both choirs sang two sets of much loved choral pieces. The soloist baritone Andrew Jenkins also sings in a choir in Abergavenny and was recently very successful in the National Eisteddford held there. Highlight of his selection was a rendition of Handel’s “Largo”. The whole evening was wittily compered by George Cooper, who concluded by accompanying himself on the guitar and singing a specially- composed song , the lyrics of which cleverly listed the highs and lows of living with diabetes. 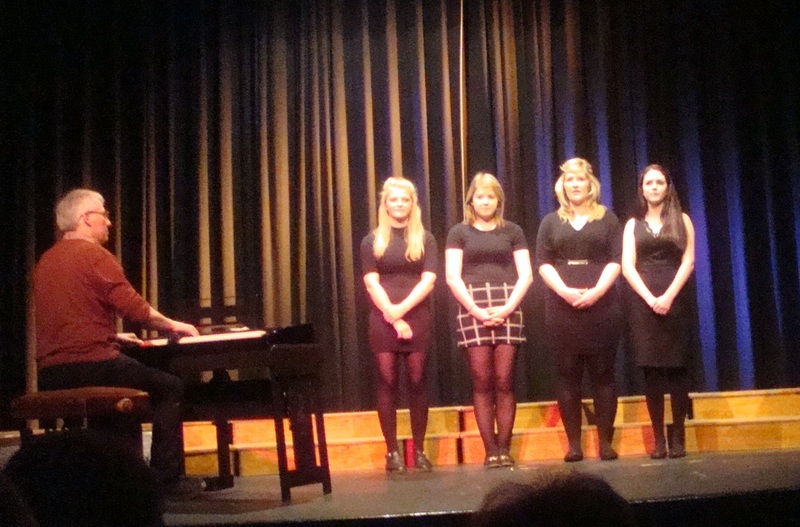 The concert was held in aid of Councillor Keith Tampin’s chosen charity and raised in excess of £800 for Diabetes UK. The Choir sang at a very well supported community concert organised by Hundred House Community Hall Committee on Saturday 15 October. One highlight of the evening was a song sung by young pupils from the local primary school at Franksbridge who echanted the audience with their action packed performance. 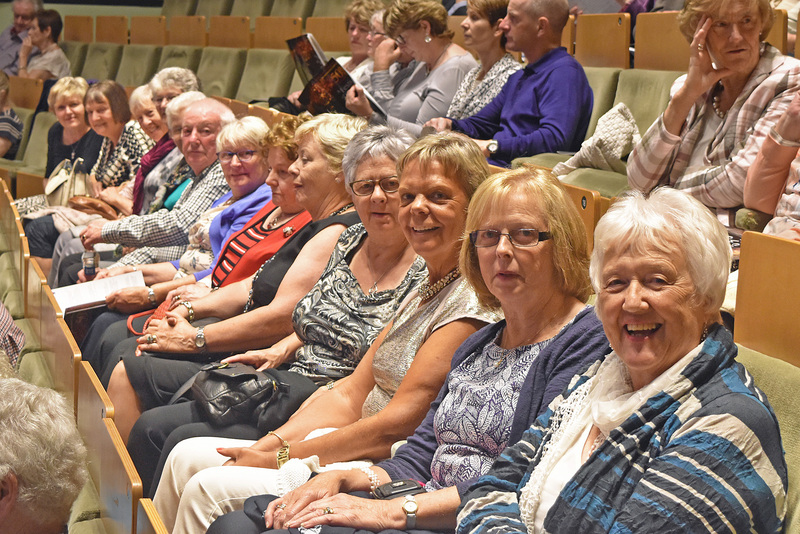 Builth Choir sang four sets and gave their first public performance of Johnny Cash’s hit “Walk The Line” which was well received by the capacity audience. On October 8th over 30 choristers gave concert in St James’ Church in Wigmore, Herefordshire. This church is one of nine belonging to the Parish of Wigmore Abbey and can partly date its history back to the third quarter of the 12th century. The Parish of Wigmore has raised £1.5million for refurbishment of a Heritage Centre and we received a very warm welcome from parishioners. It was heart-warming to sing in a building which had such good acoustics, and the concert comprised two halves, and included solos by top tenor Rhydwyn Price. Our performance was enthusiastically received and included requests for an encore. On beautiful sunny morning members of the Choir travelled across the lovely countryside of Mid and North Wales, stopping to collect six members of the Rhayader Choir, en route to Holyhead to board the ferry to Dublin. We were heading for a Festival of Welsh Choral Music in the National Concert Hall, Dublin to celebrate the 50th anniversary of Cor Meibion Cymry Dulyn. A mid-trip stop in breezy Porthmadog raised fears that the Irish Sea crossing would be more than “choppy”, but in the event the voyage was as smooth as glass. After a few drinks, lunch and a raid on the duty free shop, there followed an amazing “preglow” which lasted over an hour-and-a-half, and won applause and requests from other travellers on Deck 8 of the Stena ferry. Our driver Gwyn then struggled through incredibly heavy port traffic to deliver us safely to our hotel venue, the Crown Plaza in Blanchardstown. We received a very warm welcome from our hosts, and while we rehearsed the programme, our supporters enjoyed sightseeing and shopping in the Irish capital. A splendid evening ensued from an amalgamated choir which also included choristers from Carmarthan, Glynneath and Neath Choirs, and soloist Elin Manahan Thomas. Indeed, one former member of the Dublin Choir travelled from Australia in order to take part. The challenging programme included Welsh, Gaelic, Latin, Italian, English and American music and was appreciated by all in the capacity audience of over 1,000. The Choir would like to extend thanks to the Dublin Choir for their hospitality and their company which was much enjoyed. 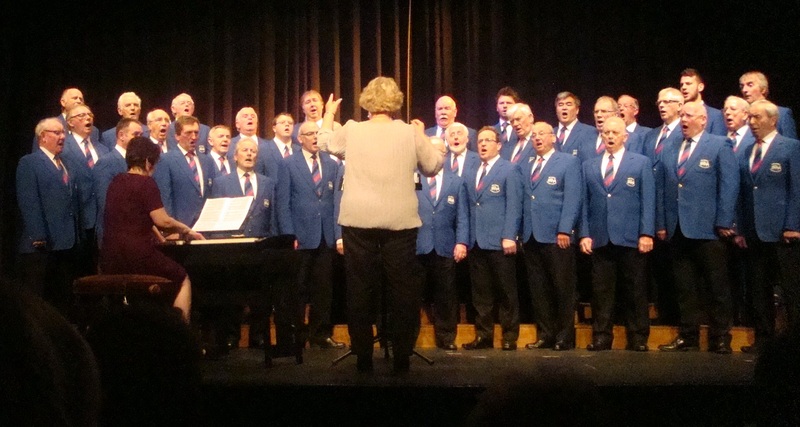 Kington Show Committee invited Builth Male Voice Choir to entertain visitors at the 2016 Show following their successful appearance at the 2015 Show. The Choir had a busy week having performed at Stage 4 of the Tour of Britain three days before and at Kington Show performed at three locations in the showground during the course of the afternoon. Their first appearance was in the horticultural marquee singing to a large and very appreciative audience. The Choir then sang at the sheep shearing arena and finally in the Members Marquee. 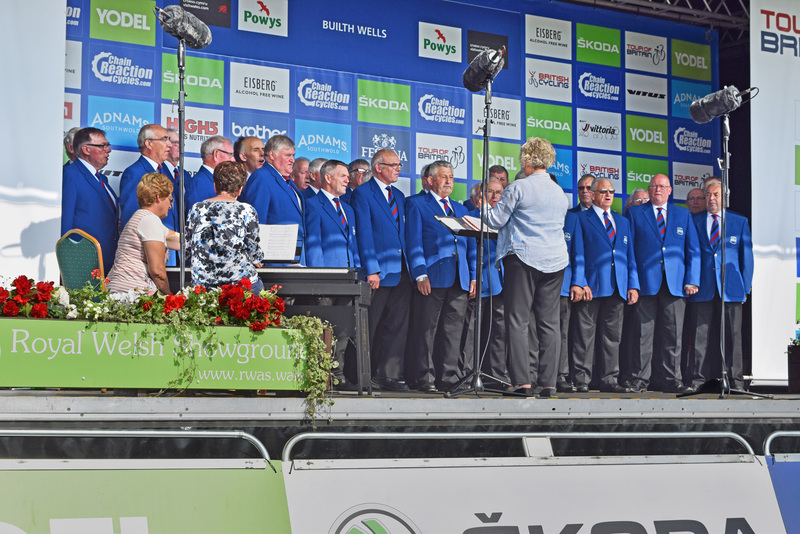 Builth Male Voice Choir entertained a large and appreciative crowd waiting for the finish of Stage Four in the 2016 Cycling Tour of Britain at the Royal Welsh Showground on 7 September. The choir sang a wide variety of songs including Welsh pieces Rachie, O Gymru and Calon Lân, traditional favorites American Trilogy, Unchained Melody and African Prayer plus other rousing songs. After their performance the Choir were able to enjoy the exciting sprint finish to the stage which was the longest of the 2016 Tour comprising of 217 kilometres through the heart of Mid-Wales – Denbighshire, Flintshire and Powys. At the finish British rider Dan McLay went very close close to victory finishing a close second to the Dutch champion Dylan Groenewegen who took first place. 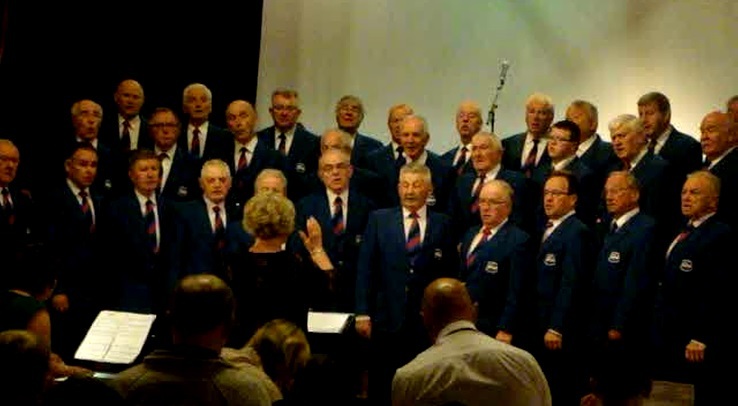 Builth Male Voice Choir entertained visitors to the 2016 Erwood Show at the invitation of Show President Roger Thornhill, a second tenor member of the Choir. The showers stopped and in warm sunshine the Choir sang a short selection of songs to a very appreciative audience. It was Saturday 2nd July 2016 and Presteigne was bathed in sunshine. It was summer after all and our Male Voice Choir had been booked for a 12 noon concert. The setting was on the playing fields of John Beddoes School where there was plenty of space for all the planned activities. The day belonged to the ‘Cancer Research UK’ charity organisation and we were guests invited to sing at their event. Our stage was a covered flatbed trailer which wobbled. This trailer was sited near the main buildings along with various marquees and changing rooms. These were all in front of a marked track which ran around the field. At various points around the track there where camping sites, about ten in all, situated like settlements with their very own population. We soon realised that this population were the supporters of ‘The walk for life‘ and ‘We have beaten cancer‘ group shown in the main photograph setting off on their walk around that track. It was quite an emotional moment as the walkers were applauded at the start by all the choir members and by all the camping settlements en-route. After the lap was finished everyone settled down and the choir entertained the crowd with some very good singing starting with ‘Stout Hearted Men’ and ending eight pieces later with ‘Gwahoddiad’ a rousing Amen. Well done Presteigne and all the organisers, well done ‘Cancer Research UK‘, the Builth Male Choir were privileged to be part of your day. 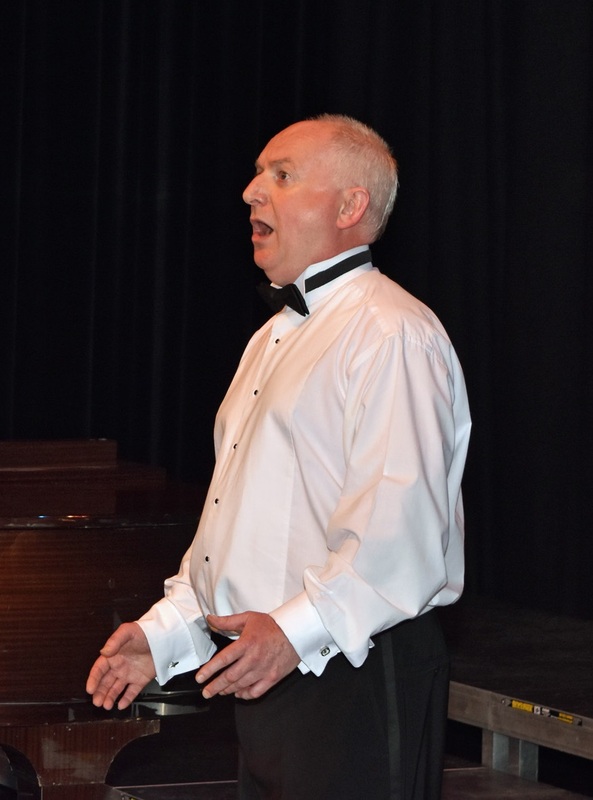 On Saturday 11 June the Wyeside Arts Centre hosted a very successful concert featuring Penzance Orpheus Ladies Choir, baritone Andrew P Jenkins from Newport and Builth Male Voice Choir. The Penzance Ladies were on their first tour to Mid Wales and performed a varied programme of songs including a medley from Mama Mia, an arrangement of Leonard Cohen’s Hallelujah and Lullaby of Broadway. The audience was honoured to be given the opportunity to hear Andrew P Jenkins, a Welsh baritone of rare quality, who enthralled everyone with his performance. His first song about the mountains of Wales was very atmospheric with beautiful accompaniment by Anne Bufton and one of the highlights of the evening. 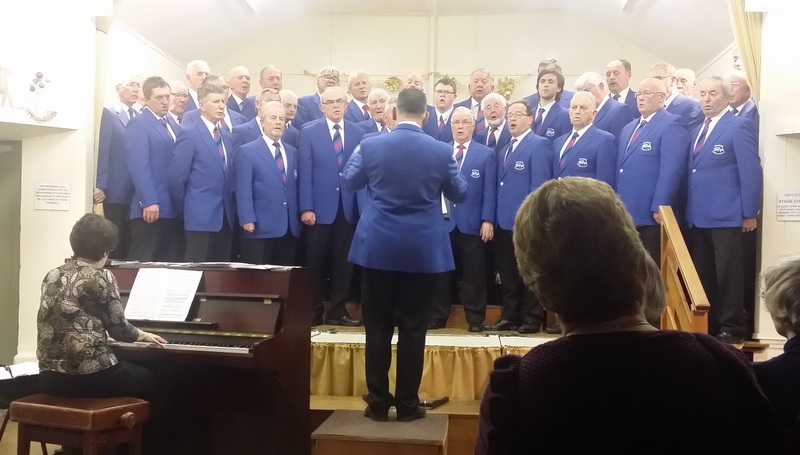 Builth Male Voice Choir gave a quality performance of songs in English and Welsh and joined the Penzance Ladies in a finalé of three joint pieces – Let it be me, Hine e Hine and Unchained Melody – conducted by Stephen Lawry. The Concert concluded with a rousing rendition of Mae hen Wlad Fy Nhadau which the Penzance Ladies had learnt to the delight of the audience. At the end of the evening the two choirs and soloist gathered in the Greyhound Hotel where they enjoyed a singalong with talented young twins from Penzance leading the way. During the concert the President of the Builth Male Voice Choir, Jim Evans presented a cheque for £1,000 (raised at the St. David’s Day concert in March), to the representative of the Welsh Air Ambulance Service, Helen Morris. Helen Morris representing the Welsh Air Ambulance Service receiving a cheque in the sum £1,000 from Jim Evans, President of Builth Male Voice Choir. Builth Male Voice Choir was invited back to sing again for the 2016 Rorke’s Drift Rally at the Brecon Showground at the end of May. In wet and windy weather the Choir performed in a large marquee and sang a mixed programme of traditional Welsh pieces and popular modern pieces. 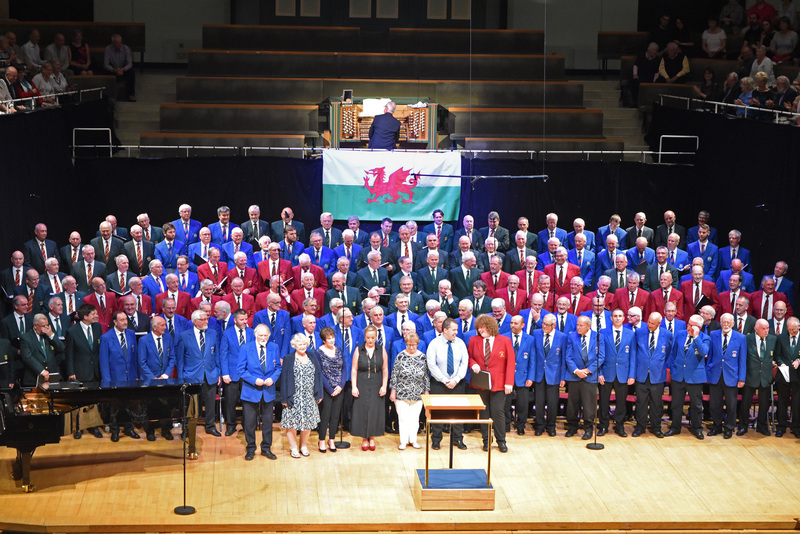 Some members of the colourful audience were drawn to tears of emotion when the choir sang “Calon Lan” and at the end gave a standing ovation demanding an encore. Once again the Choir members and supporters thoroughly enjoyed the event despite the inclement weather and thanked the Rorke’s Drift Rally organisers for their hospitality and welcome. 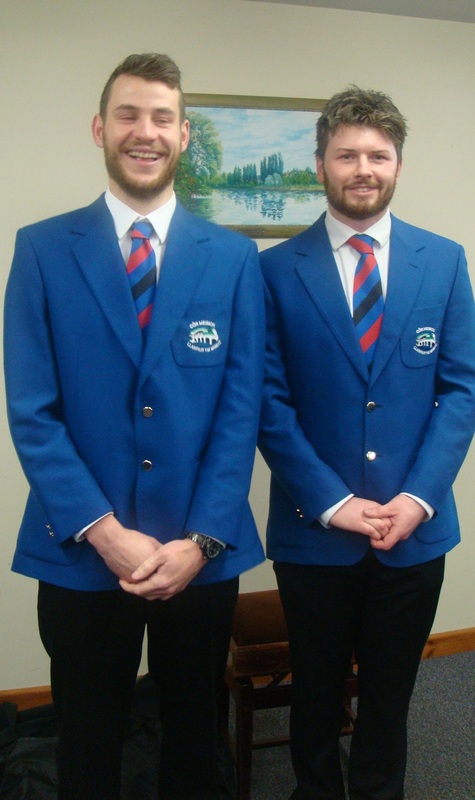 Knighton Town Silver Band invited Builth Male Voice Choir to sing in the Band’s Spring Concert at Knighton Community Centre on Saturday 23 April. The Choir performed two sets of five songs in each half of the concert, the first conducted by Luned Jones and the second by Adrian Morgan. 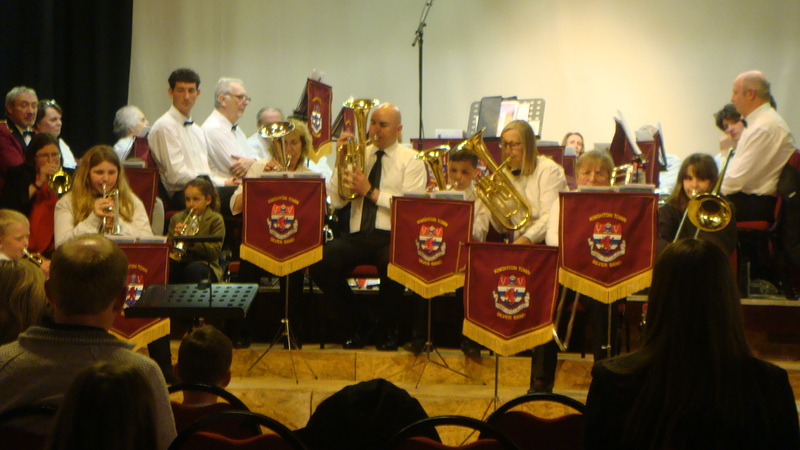 Knighton Town Silver Band also showcased their junior trainee band giving some of their young enthusiastic members their first experience of performing in front of a large audience. Choir performing Anfonaf Angel in the Spring Concert. 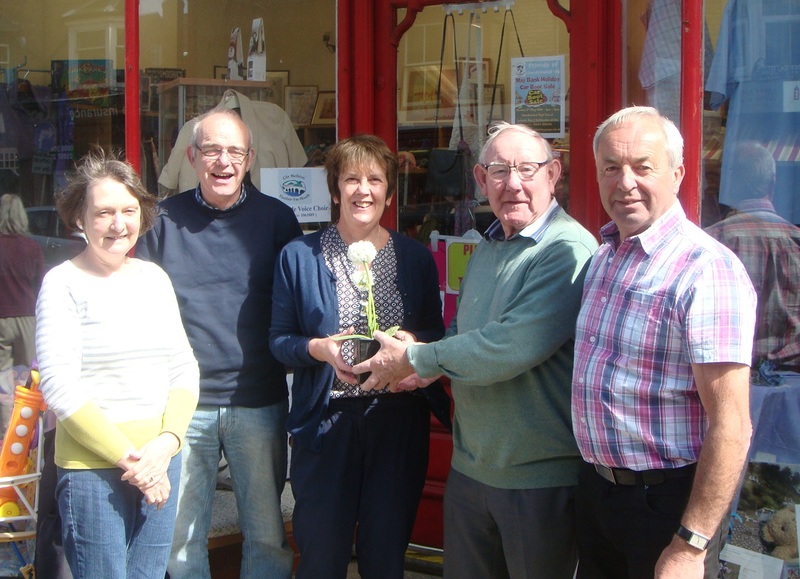 Builth Male Voice Choir held a very successful sale at Llandrindod Charity Shop from 16 – 23 April 2016 to raise funds to support the Choir. Chairman Viv Jones thanked everyone who had generously given goods for the sale and all the choir members and their partners who had helped to man the shop and make the week’s activity so successful. 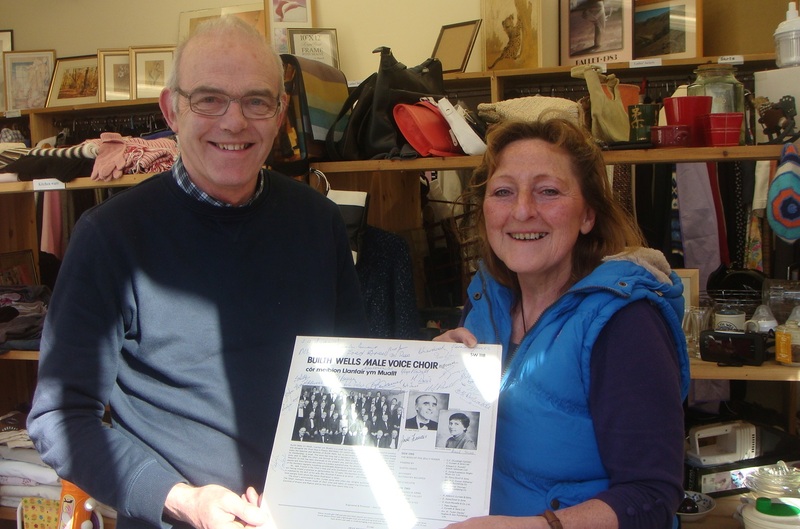 He gave particular thanks to Janys Rees from Llanyre who visited the shop and presented an LP recorded by the Choir in 1980 with a cover signed by most members from that time. The Choir will be holding another fundraising sale a the Llandrindod Wells Community Charity Shop in 2017 from 24 June – 1 July. The Spring Concert at Holy Trinity, Llandrindod Wells attracted a large and appreciative audience in a fundraising event for Llandrindod Twinning Association on Saturday 2 April. Builth Male Voice Choir was supported by Mid Powys Youth Choir under the baton of Eleanor Madoc-Davies and local soprano soloist Holly Richards from Llandegley. The young singers from the Mid Powys Youth Choir enchanted the audience with the high quality of their harmonies including new Welsh pieces that will be performed at the National Eisteddfod later in the year. Holly Richards, a talented young soprano soloist from Llandegley who has built up a repertoire of popular songs for Music in Hospitals, received rapturous applause after her polished performance. 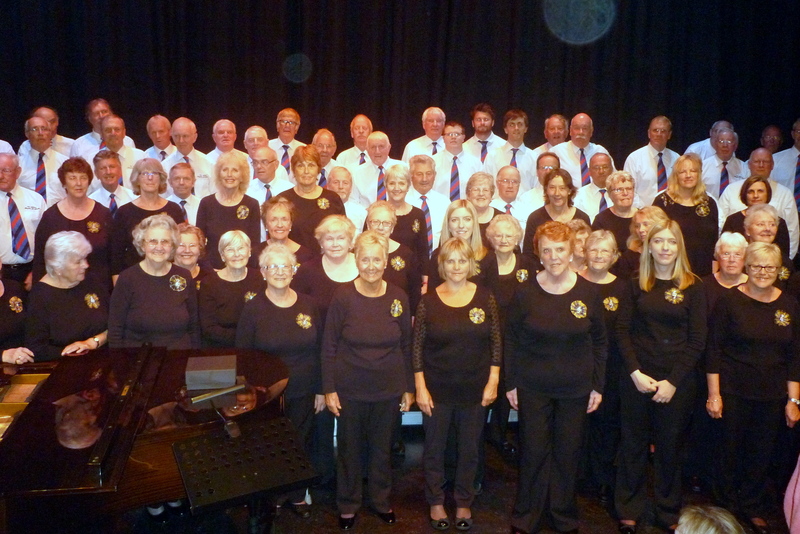 On Sunday 20 March Builth Male Voice Choir and The Llanbadarn Girls performed in a Charity Concert at the Conquest Theatre, Bromyard to raise funds for the Midlands Air Ambulance. The Concert was a great success with praise and thanks of appreciation from a large and responsive audience who asked the choirs to return again soon. 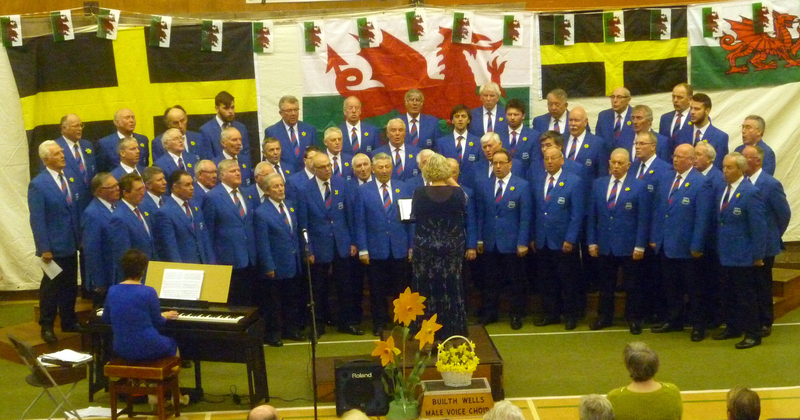 On Saturday 27th February Builth Male Voice Choir hosted one of its most successful St. David’s Day Concerts at Builth Wells Leisure Centre. 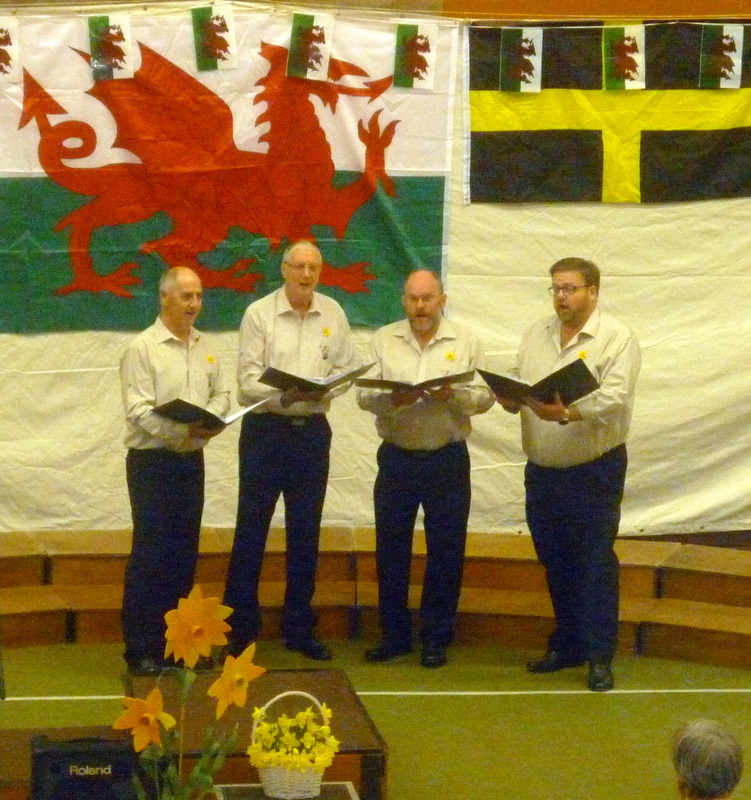 The Concert received tremendous support from regular concert attendees and the people of Builth that ensured a packed and enthusiastic audience in the hall, which was appropriately decorated with Welsh flags and banks of daffodils. The programme included a wide variety of music and featured soprano Annwen Williams from Neath, talented young musicians from the Builth High School and the tremendously popular Buccas Four vocal quartet from Cornwall. A highlight was the rendition of the ‘Baroque Flamenco’ performed on the harp by Builth High School pupil Martha Powell who earlier in the day had been placed second in the Young Musician of the Year contest in Cardiff. 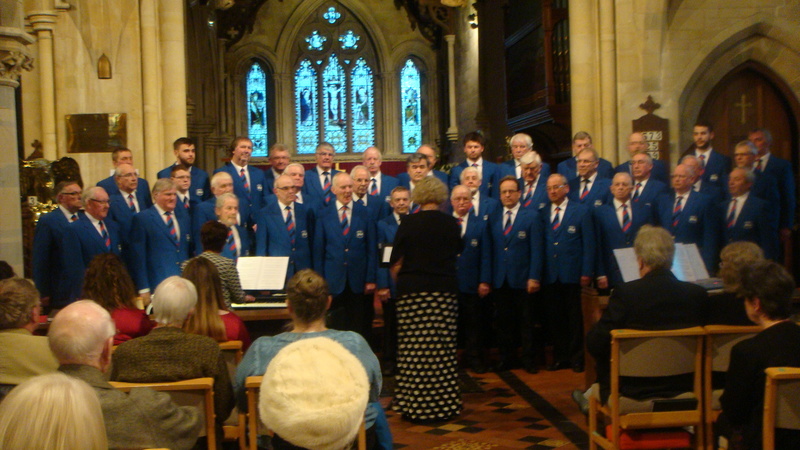 Builth Male Voice Choir contributed songs in both Welsh and English, including Pan Fo’r Nos Yn Hir and With A Voice Of Singing, as well as popular favourites such as Rachie and the American Trilogy. Two year seven pupils from the High School also provided musical accompaniment for the Choir when singing Down by the Riverside in an arrangement by John Rutter. The Concert was thoroughly enjoyed by all who attended and enabled a considerable sum to be given to the Wales Air Ambulance Charity. The Choir was pleased to take part in the Concert at Victoria Hall Llanwrtyd Wells to support the Co-Responders new vehicle. At the start of the Concert Viv Jones, Chairman of the Choir, welcomed new choristers Rhys Davies and Aled Davies to their first performance with the Choir and wished them many years of enjoyment singing with Choir. On a wet and stormy night the Choir was well represented at the Newbridge-on-Wye Carnival Committees fundraising concert. It was a pleasure to share the concert with the ladies from Ffrindiau Choir and give our novice MC David Power his initiation on home territory.